Home grown tomatoes are my reason for living in summer. Nothing in the whole wide world beats a home grown tomato! But, here it is, the start of Fall and time to say goodbye to our garden and tomatoes. Sad day for Sparky and me. 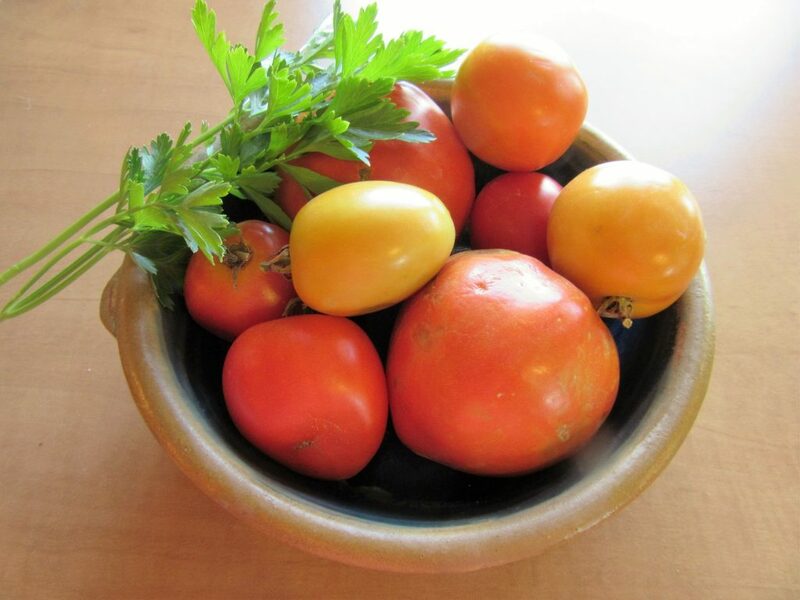 But, when I heard there was a hard frost in the forecast, I went out and gathered all the remaining tomatoes. Green. Half ripe. Three quarters ripe and spot on! They all were invited inside to live out their days. We have not enough to can or turn into a Relish but a few too many to just eat so I looked for ways to show case their deliciousness. 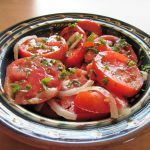 This Tomato Salad Bowl has been a family favorite for 30 years. I remember the first time I made this for a family gathering and my Mom could not get enough of it. Winner! So, here I have for you a recipe sure to become a family favorite. So easy. So basic. Just using the freshest ingredients for a scrumptious result. Can anything so easy really be this delicious? Oh yes it can! 30 minutes from start to serving and be prepared for rave reviews. Slice the Tomatoes about 1/4 inch thick. Slice onion very thin and place both in a medium sized bowl. 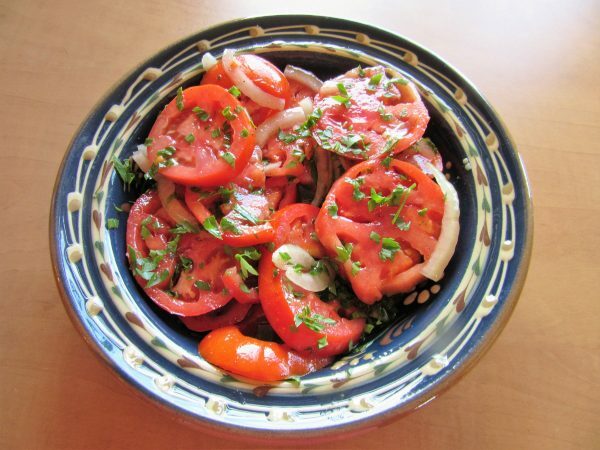 In a small bowl, combine the Parsley, Olive Oil, Red Wine Vinegar,Mustard, Sugar, Salt, Pepper and Garlic. Whisk until well combined and pour over the Tomatoes and Onions. 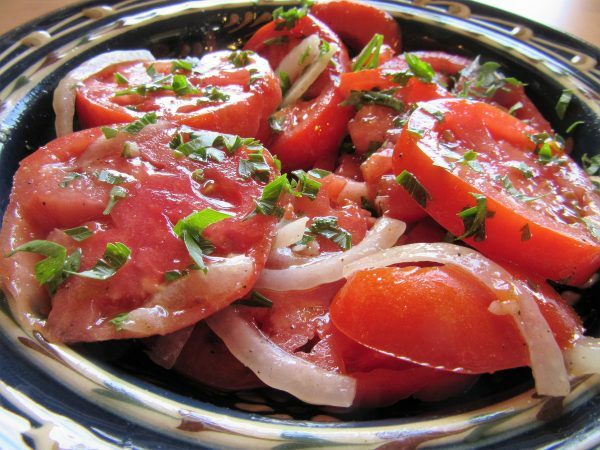 Gently fold until all the Tomatoes and Onions are well coated. Cover with plastic wrap and set aside for 20 minutes at room temperature, then serve. Bet there will not be one single bite left! Thanks for stopping by today! Wherever your journey leads you today I hope you all are enjoying the last days of warm weather and the remains of our summer vegetable bounty. Whether you grow it yourself or shop the local farm markets, fresh is always best.